The detailed Angel Wing design measures about 15mm wide and is a nice medium weight. The design and torpedo style flip cuff link mechanism are professionally soldered and the entire piece is plated in Gold. This design is also available in a Silver Plated finish. Perfect size. Perfect color. Fast shipping. Great response times from owner. We got these as a memorial for our infant son who passed away during our wedding and I couldn’t have been more pleased. Definitely recommed. Even cuter in person. My husband is delighted. We want satisfied customers! All of our cufflinks designs are priced at least half off retail store pricing. If you are not completely satisfied with your purchase, return it to us and we will refund you 100% of the purchase price. 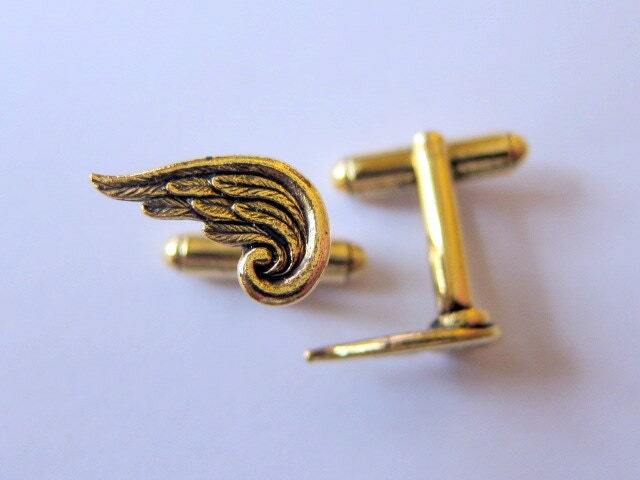 All of our cufflinks are giftboxed and shipped via USPS First Class Mail to any US address at no extra charge. International shipping via USPS Priority Mail International 5-7 day service is also available at a reasonable flat rate to most countries worldwide. You will receive delivery confirmation information in an email from Paypal once your order ships.